How to write a Industrial Electrician Job Description? 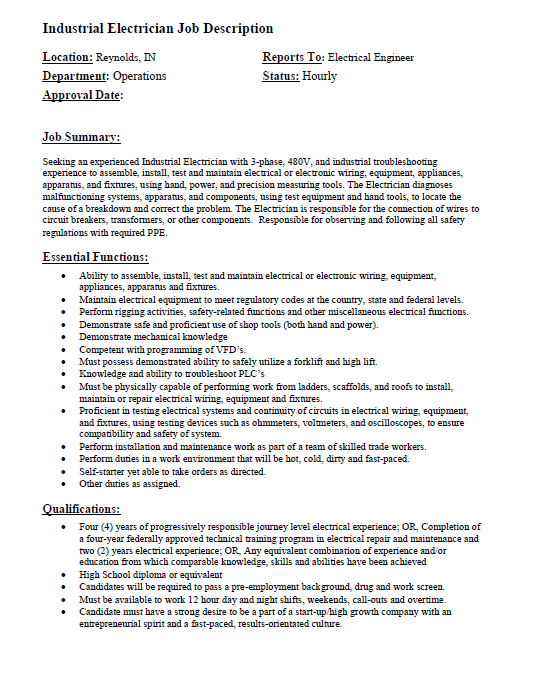 An easy way to start is to download this Industrial Electrician Job Description template now! The job of an electrician is not only complicated but extremely demanding and challenging as well. Now, if you have an opening for the post of an electrician, you need to come up with a stellar job description that lets you attract all the right candidates. A Job Description needs to be well written and attractive enough. That is precisely why these electrician job description templates come in handy. In case you need one, you can take a look at the templates here. The job of an industrial electrician has more requirements and criteria than usual. That is because it is a tough, challenging, and demanding job. Now if you want to advertise it, you can use this template. If you need an electrician to work for you on a permanent or timely basis, you need to send out a job description for it. This job description or electrician resume will determine the kind of candidates you hire and the kind of people who apply for the post. Don't try to reinvent the wheel every time you start to work on something new! Instead, download this Industrial Electrician Job Description template now for your own benefit! This template will perfectly suit your needs! Get free job description templates! Download our Senior Electrical Engineer Job Description free template now!